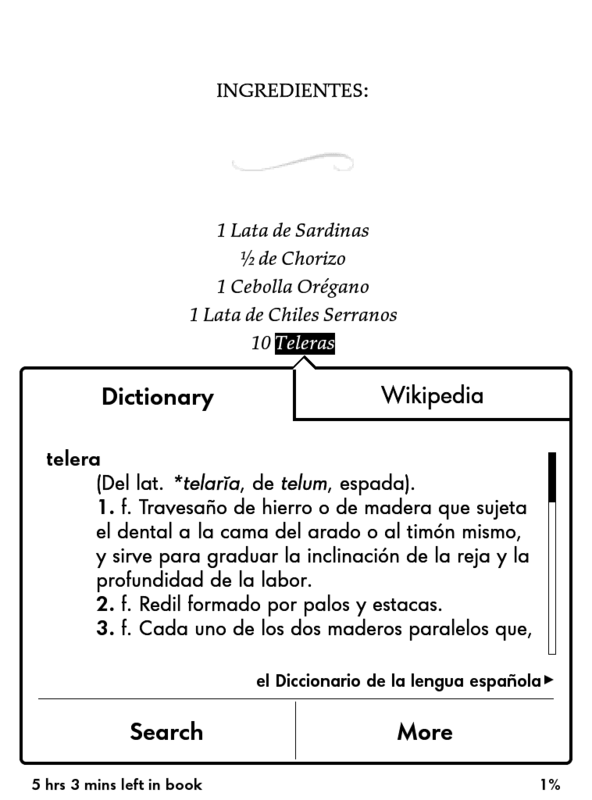 Last week, I explained how to use a bilingual dictionary on a Kindle to read novels in foreign languages. This week I'm going to talk about strategy for using the dictionary, how to switch back and forth between the bilingual and the monolingual dictionary, and how to use the translation option. When you do look up a word in the bilingual dictionary, you can fail either because there was no entry at all or because none the available entries made any sense in the sentence. If you are looking up a common word, there may be so many entries that it takes too long to find the right one. The monolingual is likely to be much larger than the bilingual, but it can fail for the same reasons, plus, it can "fail" because you're unable to make sense of the definition. For illustration purposes, I'll use the book Como agua para chocolate (Like Water for Chocolate). You don't need to speak Spanish, since I'll explain everything along the way. The first chapter is called "January: Christmas Cakes"
When the Kindle can't find a word in the dictionary associated with a book, it automatically tries to find that word in Wikipedia. This is almost always the wrong thing to do for a foreign student who is just beginning to read the language, but it does make a certain amount of sense for a native speaker. The monolingual dictionary is meant to be so large that anything it doesn't have is probably a proper name. At this point, you need to decide whether it's worth it to research the word now (or at all). In this case, it makes a certain amount of sense to say "Oh well, it's some kind of food" and skip over it. 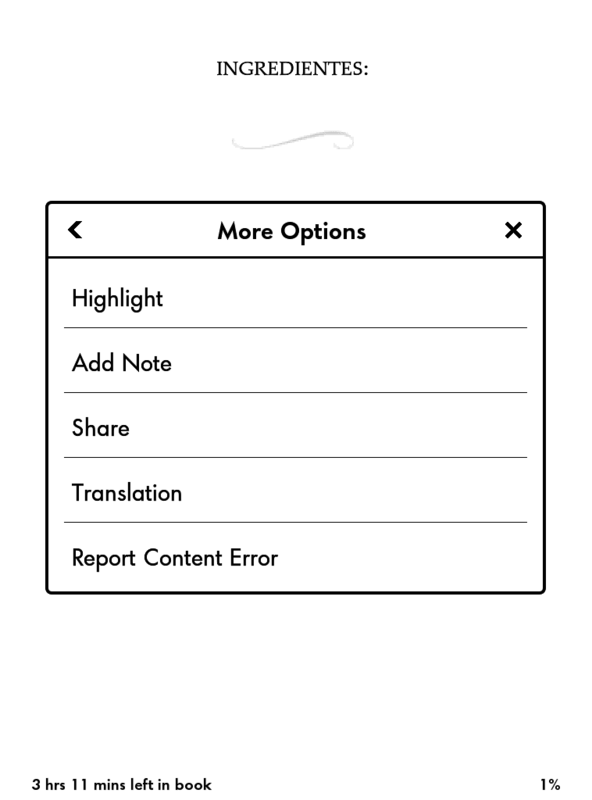 Then tap "Highlight". The highlighted text will be easy to find on any Kindle device or Kindle app--including one on your phone. (There's an option to go to note/marks.) That's lets you either come back to research it yourself at a later time or show it to a native-speaker friend. Whatever teleras means, it has to be something you can eat, so this result is useless to us. Normally, when you press on a word, the Kindle shows you a definition from the current dictionary and offers you the option to switch to any other dictionary. For some reason, Amazon does not let you do this when the original lookup failed. You must look up some other word and then you can change dictionaries. At one time, it would automatically default to a second dictionary, but apparently that feature has been removed. 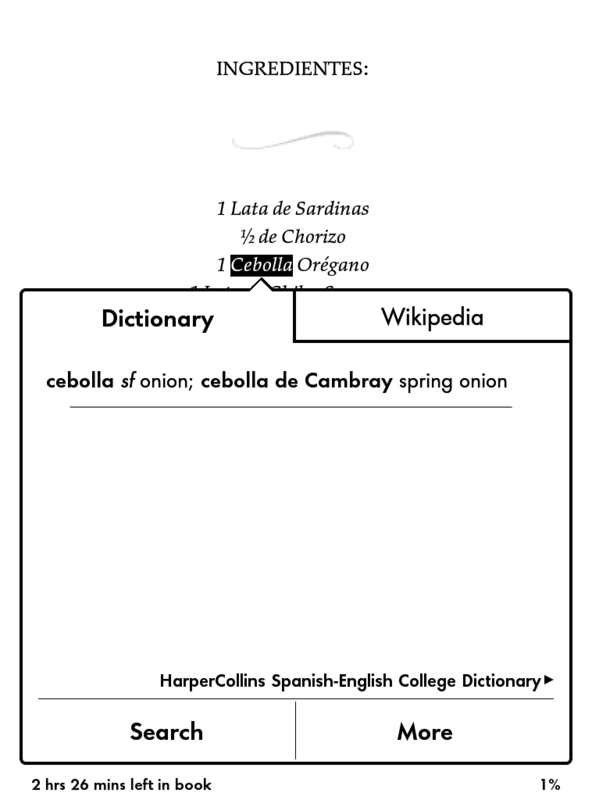 To switch dictionaries, then, simply look up any other common word, cebolla (onion) for example. 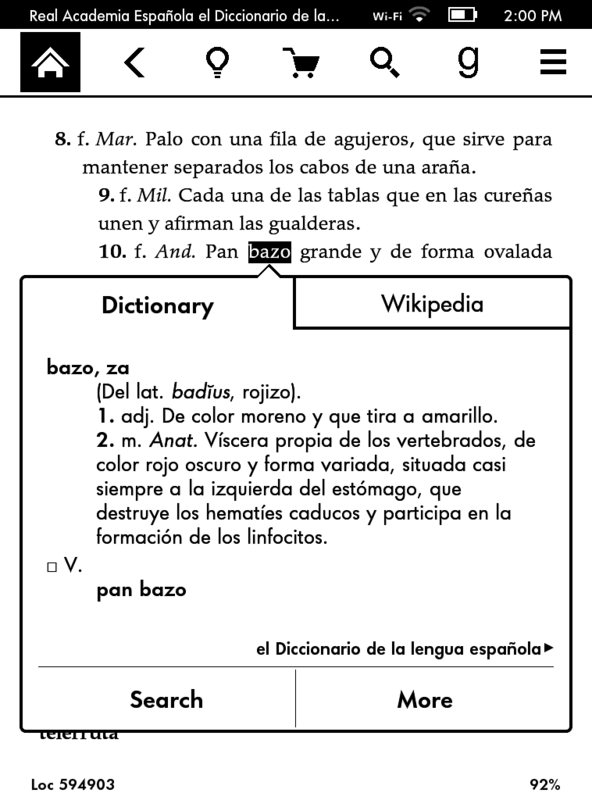 The monolingual Spanish dictionary is el diccionario de la lengua Española (usually just called the "DRAE" or even just the "RAE"). 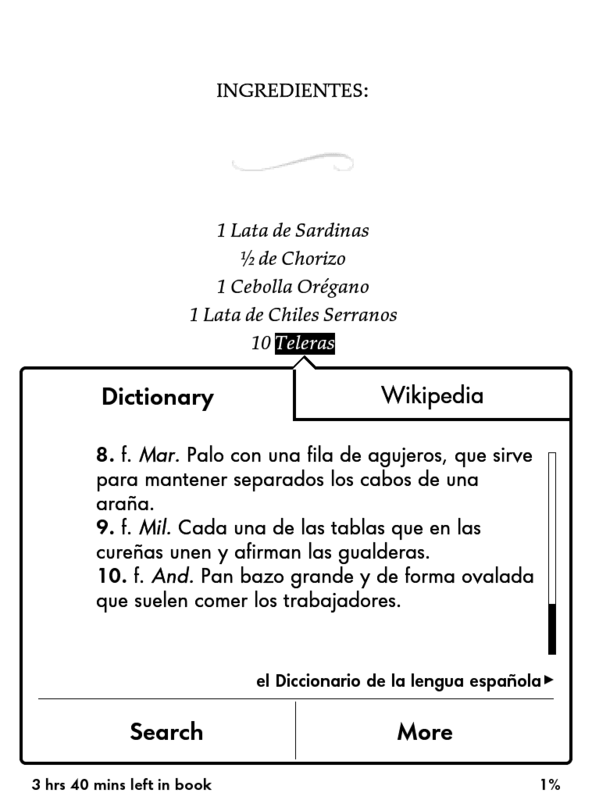 It is the authoritative dictionary in the Spanish-speaking world, it's enormous, and it's free on the Kindle. 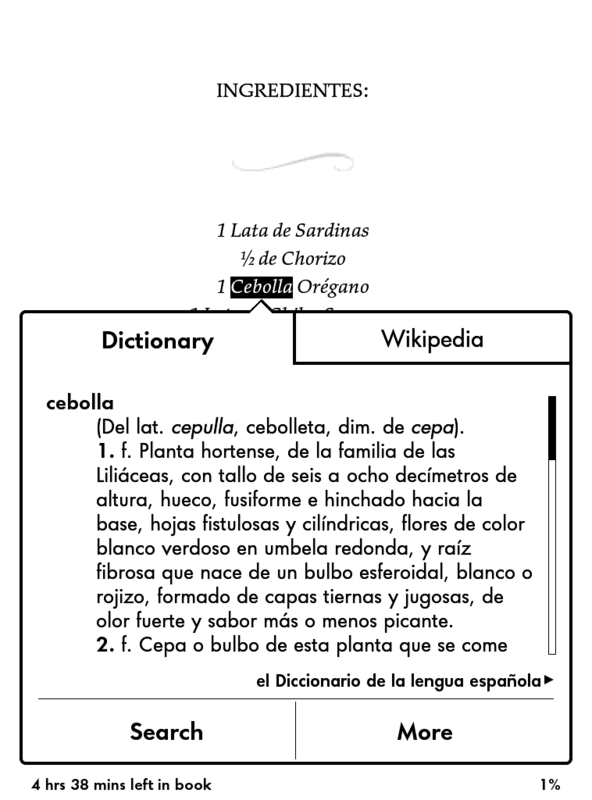 Select that dictionary and we get a much, much longer definition for cebolla. By doing this, we have changed the default dictionary for the book. Now we can close that entry and press on teleras. This time we get a definition! 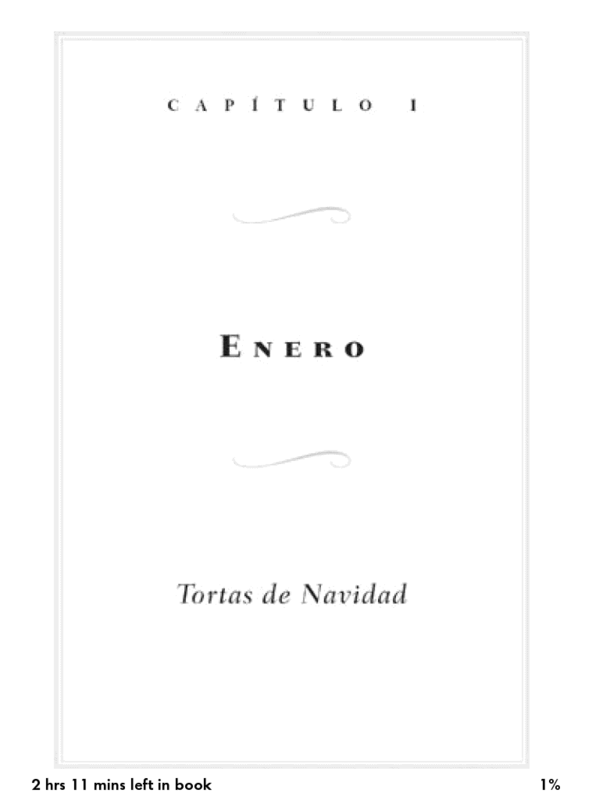 Of course, it's entirely in Spanish, and it's also very long. 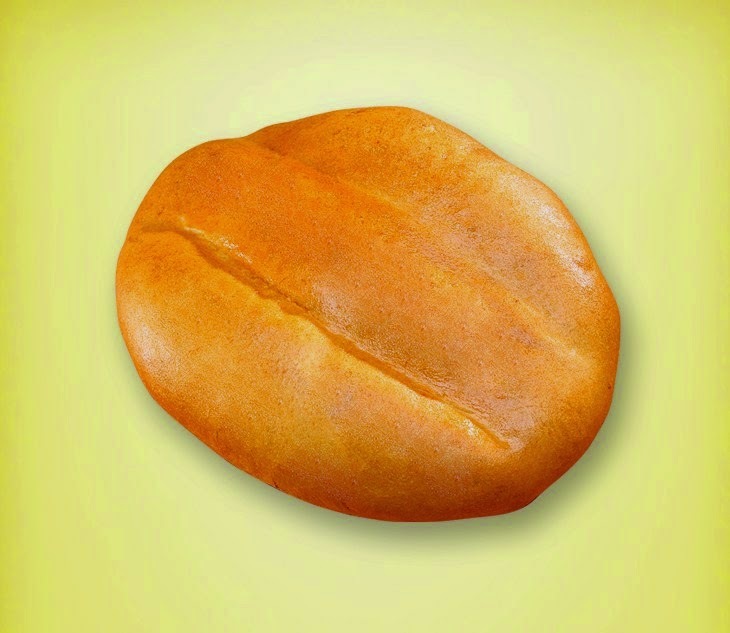 A reader with intermediate Spanish ability should be able to figure out from this that a telera is some sort of bread, that's it's large, oval shaped, and usually eaten by workers. For most readers, that should be sufficient and they can continue with the story. Suppose you're not "most readers" and you really, really want to know what bazo means in that definition. In that case, you'll want to open the monolingual dictionary as a book and then use the bilingual dictionary to read it. Start by tapping "More". 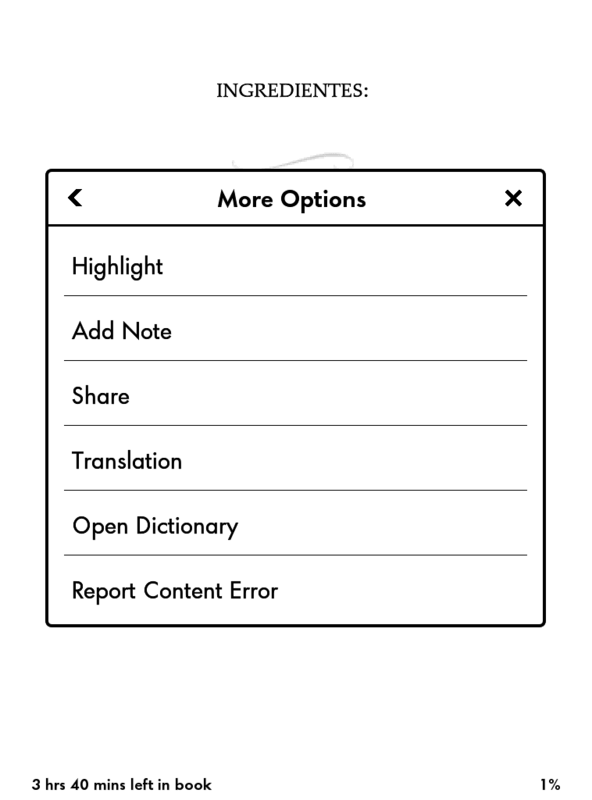 Notice that there's a new option: "Open Dictionary." Tap on this, and you've opened the DRAE as a book, positioned in the same place. Now you can select bazo and look it up. The reader can probably puzzle out that it's an adjective meaning "brown verging on yellow." The second definition seems to say something about the viscera of vertebrates and something that's dark red, irregular, and usually to the left of the stomach. We hope that's not what goes into the Christmas cakes! If you switch to the bilingual dictionary at this point, it simply offers "spleen" as a translation, which is consistent with the DRAE's second definition, but obviously (we hope) not applicable to the recipe. Finally, at the very bottom of the screen, the DRAE tells us that pan bazo is a collocation. That is, the two words together mean more than "brownish-yellow bread." Much as "brown sugar" means more than just sugar that someone has dyed brown. To explore this further, we should actually be looking at the definition for pan (bread). Since we already have the dictionary open, we can search for pan just by pressing on the word, but before we do that, it's worth trying to use the translation option again. We select the whole sentence this time. We tap "More" and then "Translate," as before. This actually highlights the strengths and weaknesses of the translation option. It can find a lot of information for you, even though the result is comical. It helps the most after you have already taken a stab at understanding the sentence on your own. Sometimes it supplies that one bit of information you were missing. In particular, it excels at finding collocations, even though in this case it comes up dry. If we go ahead and look up pan, we'll find an entry for pan bazo which explains how to prepare it, but I'll stop here. As a general rule, trying to hunt down the exact names of local foods isn't a great idea. 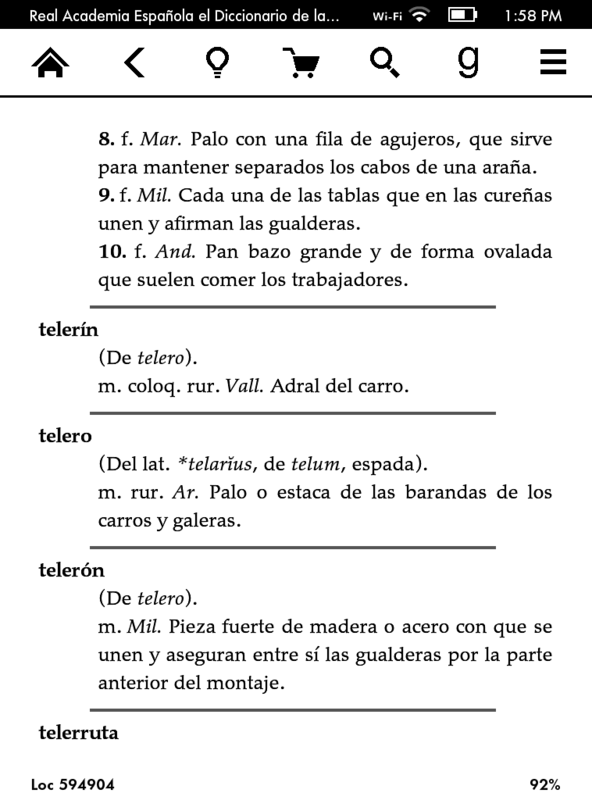 The truth is, the best translation of telera into English is probably "telera." 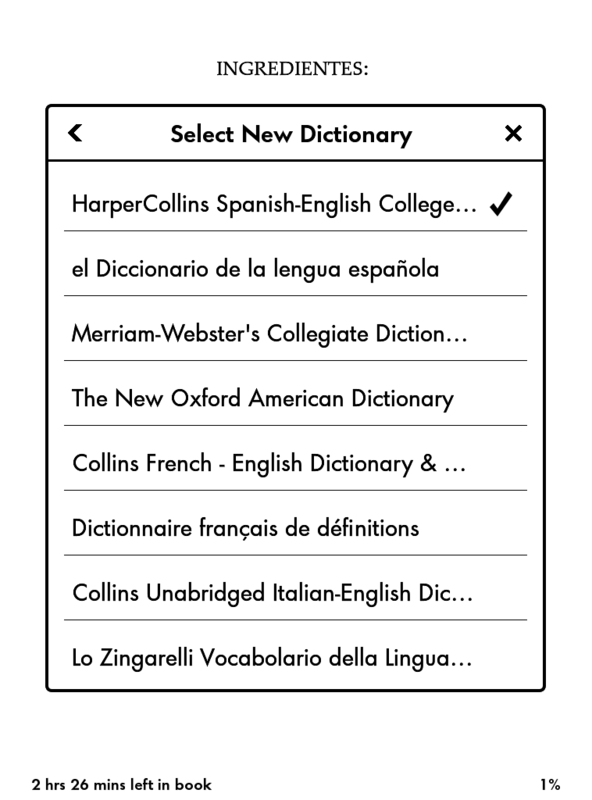 I've illustrated how to switch back and forth between the bilingual and monolingual dictionaries, how to use the highlight and translation options, and how to open the monolingual dictionary as a book. 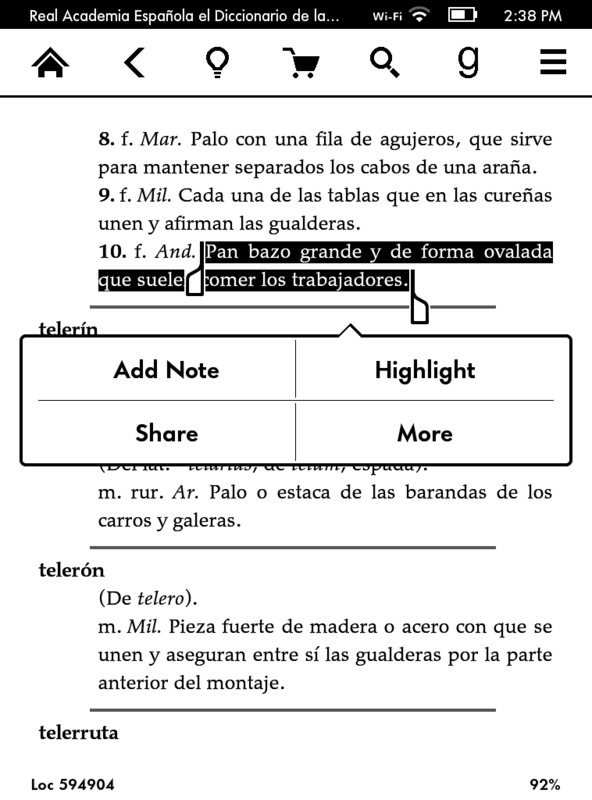 In next week's posting, I'll discuss how to use online resources besides the Kindle to research hard-to-translate words. For example, if we google telera we immediately find that it looks pretty much like we expected it to. Thanks for the riveting blog, which is packed with useful information, suggestions and links. 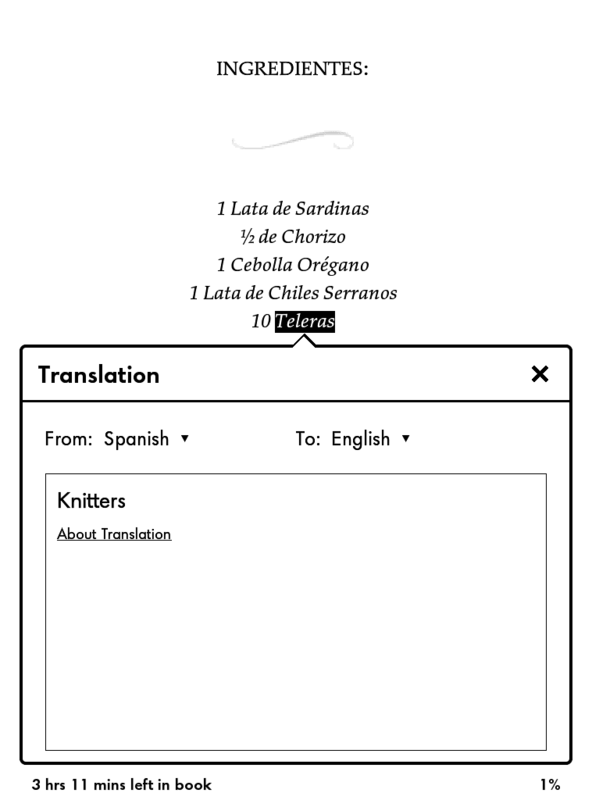 I share your view that the Kindle speeds up reading books in a foreign language enormously. It would do so even more if the time spent looking up words could be shortened. Two things would make a significant difference here. Firstly, restoring the “dictionary cascade” feature whereby if a word isn’t found in the default dictionary the other dictionaries for that language are automatically interrogated. 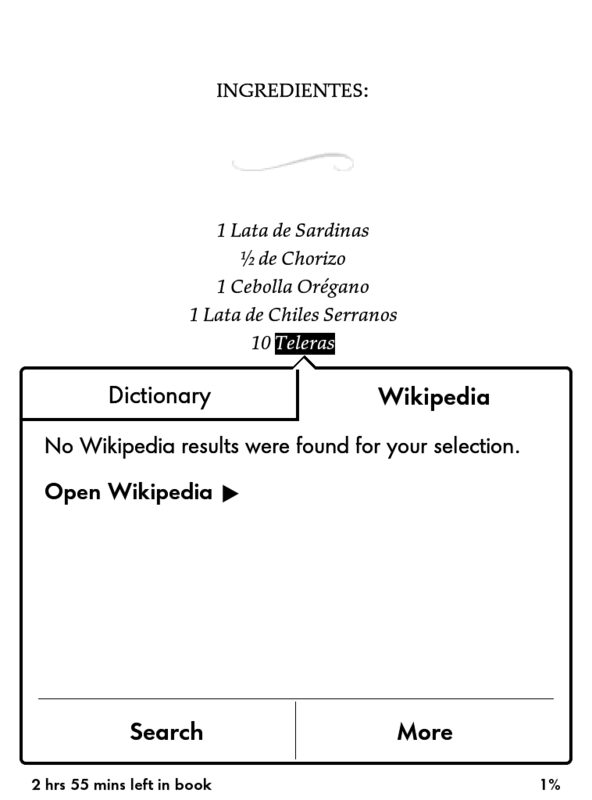 Secondly, when no definition is found there should be a specific option to open a search page for the default dictionary that brackets the missing word; in many cases one would immediately spot a related one that suggested its meaning. I've conveyed that (and other suggestions) to Amazon's Kindle team. They've implemented some of the things I've suggested, but only some. The cascading feature has been deleted more than once. I talked them into restoring it a couple of years ago, but it got removed again not long ago.